Summary : Not your garden variety green tea, this one is tasty with a moderately strong flavor. If you are new to drinking green tea, this is a very good tea to start with. Review : Of all the teas in the world today, green tea is by far the most popular. And due to it health benefits, green tea just continues to gain in popularity. Now, I'll be truthful here. I've never really been fond of green tea before. The green tea I've had in various chinese restaurants and such has been, well, a bit lacking in any sort of distinctive taste or flavor. However, before trying this tea, I never really had good green tea before, either. So, when I gave this tea a try, I was quite open minded about it - as I wanted the health benefits of green tea too! The first thing that impressed me about this tea was the aroma. Straight out of the nice little container that Adagio packages their samplers teas in, it was obvious that this was going to be a very different green tea. The tea had a powerful, rather spicy aroma about it. Moreover, I was very impressed by the size of the tea leaves. Other green teas I've seen (the bagged type), have been full of tiny tea leaves. It doesn't take a genius to realize that these leaves are essentially the "left overs" - so I was happy to see the quality leaves that Adagio Teas put into this tea. And the taste of this Spiced Green Tea was not disappointing, either, I'm happy to report. Unlike other bland green teas I've tasted at various restaurants, this tea had a very strong, but rather pleasing, flavor about it. And make no mistake, the flavor of this green tea is very distinctive! 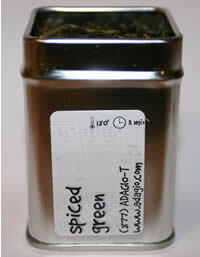 Now, Adagio Teas says this tea has a light taste about it and is a good tea for new "green tea" drinkers. Well, I can see where this would be a good green tea for people new to drinking green tea, but light flavored? Hmm...can't really see that. Compared to any other green tea I've tried, this tea packs quite the taste to it - which to me is a good thing of course! About the only thing "light" about this tea I found is it's pretty light green color. Overall, I was quite happy with this Spiced Green Tea. While it may not be my favorite tea in my cupboard, it is one of my favorite green teas. So, if you are new to drinking green tea, give this a try. The tea has a nice, distinctive flavor to it and in no way compares to the rather bland green teas found in most chinese restaurants (which generally use bagged bigelow/stash/celestial seasoning green teas). Recommendation : A very tasty green tea that is especially well-suited for people who are just beginning to drink green tea. Brewing Instructions : Pour 6 ounces water that has a temperature of 180 degrees (not boiling! ), over about 1.5 teaspoons of green tea leaves. You want to use more than 1 teaspoon of leaves with this tea because the leaves are quite large (which throws off precise teaspoon measurements). Let steep for 3 minutes. I steeped mine for 4.5 minutes by accident and it still tasted great! So, for a stronger, more distinct taste, brew for a longer period than 3 minutes. Republic of Tea Green Chai Tea : An excellent and rather spicy green chai tea...with a very strong cinnamon flavor.